When it came to collecting, former Neiman Marcus fashion executive Derrill Osborn had a singular focus: cows. From paintings featuring bovine roaming wide open spaces to small toy cows to Staffordshire ceramic figures of the animals, Osborn collected them all. 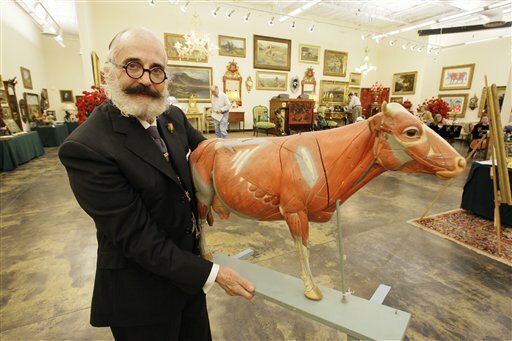 And after about half a century of collecting, the 70-year-old has decided to part with his herd in an auction Wednesday evening featuring about 350 items. "I decided I would just give it up and auction it off," he said. His collection made for a dramatic interior in his two-bedroom town house. The home's walls lined with green billiard cloth and wood accents painted a red enamel, his paintings hung from floor to ceiling and his cow-related objects were spread throughout. "It was a little too much, but it was fantastic," said Osborn, dressed finely in a three-piece suit, his eyes sparkling behind round-rimmed glasses. The auction also will feature a few non-bovine items including a Victorian croquet set and several items of furniture. But the cows are the stars. Osborn, who grew up on a New Mexico ranch, said the spark for the collection came when he was a young boy and his great-grandfather whittled a cow from wood for him _ an item not in the auction. And even though Osborn left that ranch for a 40-year career in fashion that took him around the globe, items featuring cows still caught his eye as he wandered through antiques stores from Milan to London. After spotting an anatomical plaster model of a cow in a Paris shop window, it took him about two years to persuade the shop owner to sell _ a story Osborn said he could tell about many items in the collection. One oil painting was a work he commissioned William Forauer to create from a photograph Osborn had from his family's ranch. In the painting, which is expected to sell for between $2,000 and $4,000, a group of cows are coming down a path, facing the viewer, something that's unusual for cow paintings, which usually show the animals from the side, Osborn said. "This painting could be haunting at times. I mean haunting in a pleasant way," he said. An oil painting by Donna Cook called "Chisholm Trail Cattle Drive," which is expected to sell for between $5,000 and $7,000, depicts a whooping 5,000 cattle. Two Staffordshire figures _ one of a cow, the other of a bull _ that are almost 14 inches tall are estimated to sell together for between $7,000 and $12,000. Scott Shuford, president of Dallas Auction Gallery, which is handling the sale, said auction items that are getting a lot of interest are Osborn's collection of more than 300 vintage toy cows, horses and other farm animals. That group of toys is expected to fetch between $1,500 and $2,500. "The collection runs the gamut. He's bought from all over the world," said Shuford, who estimates the whole collection could go for more than $500,000. Osborn, who spent 25 years at Neiman Marcus before retiring as men's clothing director in 2002, said it was a bit sad to watch his collection be auctioned off, but he said he looks at it as another experience in a life full of experiences. He also thinks the auction house will find good homes for his cows. "We're giving these little cows a good farewell," Osborn said.